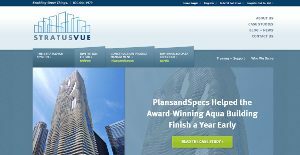 StratusVue is a construction management software system that has been designed to be seamlessly integrated to manage projects from design to operations. With solutions such as BidVue, PlansandSpecs and BIMfx together any data transfer issues are minimized, if not eliminated altogether. StratusVue provides a state-of-the-art platform, developed specifically for the construction industry that provides role-based project and document management for all stakeholders from design through building operation. It is a platform developed as an integrated system that manages project information from the design phase, through construction, all the way to building operations. The StratusVue system aims to be an optimal all-in-one solution for the various processes in the construction industry. Through its BidVue solution, estimators and project managers will find it faster and easier to create and manage an electronic bid book, distribute bid documents, communicate with all the bidders, and manage vendor certifications and qualifications, monitor progress through every step of the proposal process. More importantly, BidVue helps reduce the number of mistakes made along the way, which saves money and improves the chances of receiving a low bid. PlansandSpecs is another solution in the system developed to improve overall project management by facilitating collaboration, providing better organization, and streamlining workflows for the documents and files that are crucial to project success. It was developed in the context of a role-based environment, which helps the whole project team to have a clear, consistent and easy-to access tools for handling key project documents such as drawings, specifications, contracts, RFIs, meeting minutes, contracts, and daily logs, among others, enabling better progress for various project works. Through BIMfx, StratusVue gives contractors, agents, and owners a straightforward, powerful tool to turnover a full set of useful data in a fraction of the time using BIM-enabled data closeout and turnover processes, a valuable tool for organizations today. If you are considering StratusVue it might also be sensible to check out other subcategories of Best Construction Management Software collected in our database of SaaS software reviews. It is essential to realize that virtually no service in the Construction Management Software category is a perfect solution that can match all the requirements of various business types, sizes and industries. It may be a good idea to read a few StratusVue reviews first as certain services may excel only in a very narrow set of applications or be designed with a very specific industry in mind. Others may operate with an intention of being easy and intuitive and as a result lack advanced elements desired by more experienced users. You can also come across solutions that support a wide group of customers and provide a powerful feature toolbox, but this frequently comes at a more expensive price of such a service. Ensure you're aware of your requirements so that you purchase a service that provides all the features you look for. How Much Does StratusVue Cost? StratusVue pricing information is available by quote. If interested, contact the vendor to get your price quote. We realize that when you make a decision to buy Construction Management Software it’s important not only to see how experts evaluate it in their reviews, but also to find out if the real people and companies that buy it are actually satisfied with the product. That’s why we’ve created our behavior-based Customer Satisfaction Algorithm™ that gathers customer reviews, comments and StratusVue reviews across a wide range of social media sites. The data is then presented in an easy to digest form showing how many people had positive and negative experience with StratusVue. With that information at hand you should be equipped to make an informed buying decision that you won’t regret. What are StratusVue pricing details? What integrations are available for StratusVue? StratusVue integrates with Citrix ShareFile. If you need more information about StratusVue or you simply have a question let us know what you need and we’ll forward your request directly to the vendor.